Fresh from a week of anti-abortion protests in Wichita, Kansas, where they held an “ ecclesiastical court” holding the Supreme Court in violation of the law of God, activists affiliated with Operation Save America have descended on Montgomery, Alabama, to rally in support of Chief Justice Roy Moore as he faces ethics charges over his defiance of the Supreme Court’s marriage equality ruling. 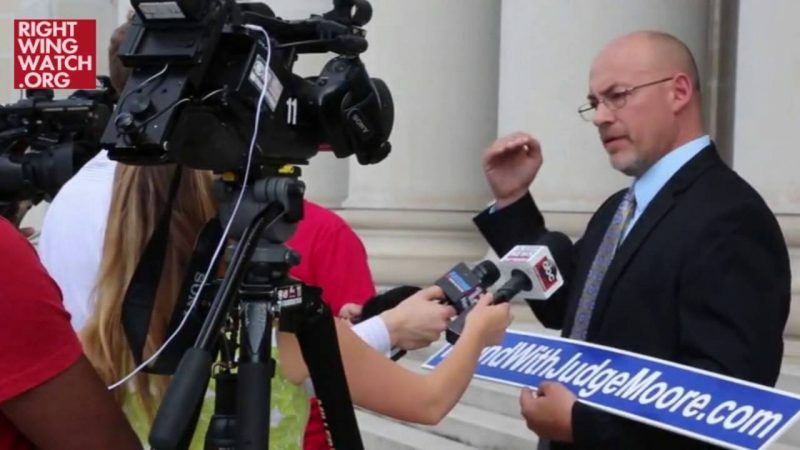 “The Alabama Court of the Judiciary has some very wicked members who aren’t interested in upholding the rule of law. 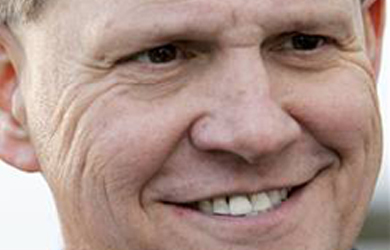 They hate God (but still go to churches) and will be trying to remove Chief Justice Roy Moore at a trial on Sept. 28 for his beliefs,” Zastrow wrote. 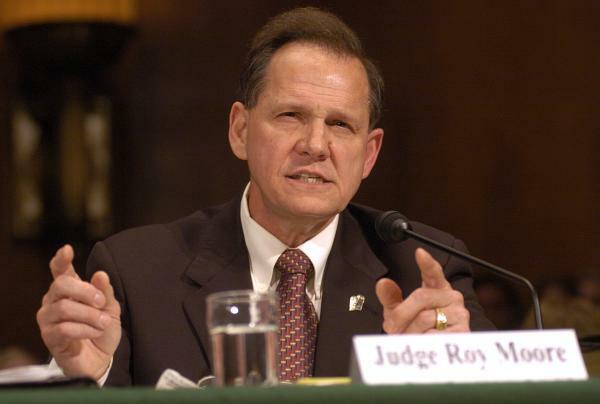 Chief Justice Roy Moore is a godly statesmen that is doing his duty as a Lesser Magistrate. His example is so desperately needed today. We pray that other Judges, Governors, Legislators, and Sheriffs will be inspired to follow his example to reapply the Constitutional chain back on the Federal beast, restore law and order, and establish the necessary checks and balances our nation needs to preserve our liberty that is rooted righteousness and justice. In about 2 hours, we will be taking our message to a busy intersection with signs and literature, then we will pray at the Supreme Court building where the “trial” will be held tomorrow. Tomorrow morning, we will have a rally at noon to support Chief Justice Roy Moore and then hopefully make it in for the actual hearing. Please saturate what is happening here in Montgomery in much prayer. His is the last man standing against the immorality, injustice, and tyranny that is stalking America. God grants us the victory and may Roy Moore serve as a modern day Daniel. As you recall, Daniel’s enemies were jealous of his excellent spirit, wise behavior, and strong work ethic. They devised a plan to remove him from office and bring about his demise. They stated, “We shall not find any charge against this Daniel unless we find it against him concerning the law of his God” (Daniel 6:5). Initially, it appeared their devious plan worked. Daniel was thrown in the lion’s den where his enemies hoped for him to be devoured. And make no mistake about the vile nature of homosexuality, it is beastly. It seeks to devour any God honoring truth or person who upholds it in the public square. To their everlasting shame and demise, however, the pit they dug for Daniel, (Chief Justice Roy Moore) they fell into the same pit. The same rock they attempted to roll over Daniel (Chief Justice Roy Moore) is the same rock that rolled back on them. Daniel was removed from the lion’s den and his enemies took his place and this time the lion’s munched. As individuals, I pray these confused folks who have been captured by this demonic lust find freedom through the love and truth of Jesus Christ. Their agenda to remake America in their perverted image, however, let that agenda fall into the pit that they have created. May the perverted agenda that seeks to make the good guys the bad guys wind up on the ash heap of history, along with every other tyrannical, blood lust of men who dared to defy and deny the authority of Almighty God in Jesus’ mighty name!